Will Smith Has Zero Interest In a Fresh Prince of Bel-Air Reboot: "When Hell Freezes Over"
Do not—we repeat, do not—look for a revival of The Fresh Prince of Bel-Air anytime soon. 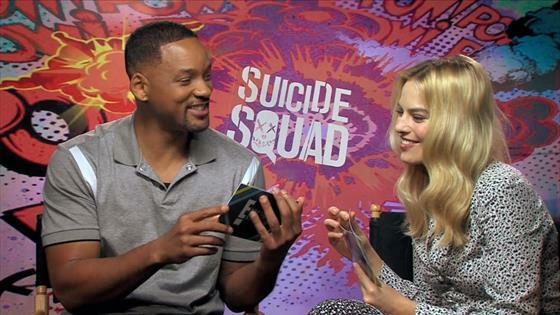 "I don't think ever, like pretty close to when hell freezes over," Smith said about possibly rebooting his classic sitcom while promoting Suicide Squad with co-star Margot Robbie. "Like we're going to leave that one alone." Rumors circulated a year ago that a reboot was in the works with Smith on board as a producer. However, some reports then indicated that the Smith project was an original sitcom possibly inspired by the Fresh Prince's fish-out-of-water storyline. The reboot was just one of many questions that were asked when Smith and Robbie agreed to interview each other for E! News. Well, Smith was a bit surprised by Robbie when they first met during her audition for their 2015 movie Focus. The Aussie actress's shoes were covered in mud and she "had shorts on and her hair wasn't done," Smith remembered. "I was like, 'She don't want this role at all.'" While Robbie did get the part, she had a good reason why she didn't look so glam—she had gone straight to the audition from a backpacking trip in Eastern Europe and the airline had lost her luggage on the way to L.A.
And Robbie was quick to remind Mr. Smith that he was actually late for the meeting. Robbie also revealed what bugs her most about Smith. Watch the video below to see their hilarious back-and-forth. Suicide Squad is in theaters on Aug. 5.